Did you know that you have just 7 days to notify the insurance company of a car accident? Did you know that you have just 10 days to notify a Municipality of a slip and fall accident? Did you know that you have only 10 days to report an accident to the Ministry of Transportation for a car accident caused by poor driving conditions on an Ontario Highway? Did you know that you have only 30 days to apply for accident benefits from your car insurer? Different cases have different limitation periods. The number one mistake accident victims make is that they fail to protect their limitation periods. Don't let the same mistake happen to you - Don't miss your deadline. Protect your case. For further information please contact us for your free consultation. 2. Get the names and contact information of the other party, potential witnesses and of the local authorities and medical personnel who investigated the accident. 3. Report the accident to the proper insurance company. 4. 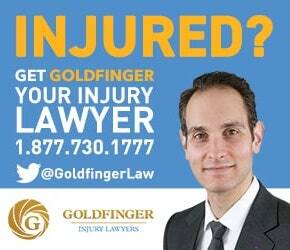 Pick up the phone and call Goldfinger Injury Lawyers for your free, no pressure, no hassle consultation with a personal injury lawyer. 5. See your family doctor or any health professional to get the medical attention that you need. 6. Collect as much information as you can in relation to the accident. This includes but is not limited to any photographs from the accident/injuries, the names and contact information of any witneses, the police report, any correspondence from local authorities or from the insurance company, any reciepts of your out-of-pocket expenses, any business cards from any people you've met in relation to the accident. 7. In all likelihood, this is your FIRST serious accident. You are likely not familiar with what needs to be done to protect your personal injury case. On the other hand, insurance companies are large sophisticated entities which are in the business of processing countless accident claims just like yours. They know exactly what needs to be done to minimize their exposure and minimize your potential recovery. Don't be taken advantage of because you don't know your rights. Contact Goldfinger Injury Lawyers today.